The HHS' Office of Inspector General fears that Medicare Advantage plans could be denying needed medical services to maximize profits, according to a new report released Thursday. When beneficiaries and providers appealed preauthorization and payment denials, Medicare Advantage organizations, or MAOs, overturned 75% of their own denials between 2014 and 2016. They overturned approximately 216,000 denials each year, HHS OIG said. During the same period, independent review entities, which handle the second level of appeals for denials, overturned additional claims denials in favor of beneficiaries and providers. "The high number of overturned denials raises concerns that some Medicare Advantage beneficiaries and providers were initially denied services and payments that should have been provided," the HHS OIG said in the report. "MAOs may have an incentive to deny preauthorization of services for beneficiaries, and payments to providers, in order to increase profits." 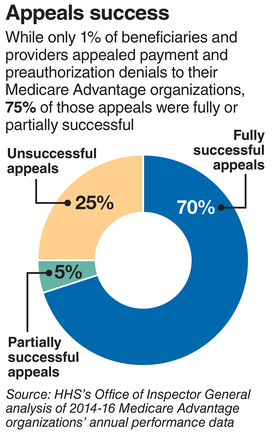 Beneficiaries and providers rarely used the appeals process. Over the two years studied, beneficiaries and providers appealed only 1% of denials. Patient advocates have raised concerns that the appeals process can be confusing and overwhelming, particularly for critically ill beneficiaries. The HHS OIG noted that patients may either be going without needed services or paying for them out of pocket because of this. HHS' OIG said that some denials may stem from legitimate issues such as a plan determining that its original decision was incorrect, or they may have lacked necessary information to approve a claim, only to receive what they needed later. Nevertheless, the HHS OIG wants the CMS to increase its oversight of Medicare Advantage plans to help ensure denials made by insurance companies are truly valid. The agency should provide technical assistance, training, education and increased monitoring or enforcement actions for MAOs that exhibit higher denial rates. 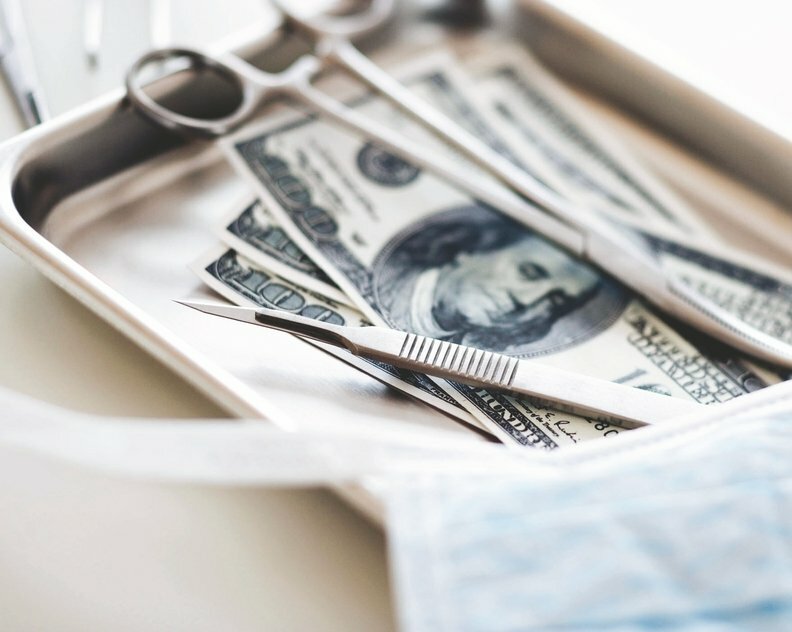 The CMS could impose civil money penalties if it finds claims are being denied for the wrong reasons or appeared to be motivated by profit, the watchdog said. The CMS also could also require plans with repeated violations to hire independent auditors to perform program audits more frequently than the CMS is able to. The CMS told the HHS OIG that it agreed that enhanced oversight of Medicare Advantage plans was needed, but it did not say what actions it will take to do so. AHIP pushed back against the report highlighting the fact that MA plans approve the vast majority of prior authorization and payment requests they receive, according to Cathryn Donaldson, a spokeswoman for the trade association. "It is also important to distinguish between patients getting needed care and providers receiving payment for services delivered, which the OIG reports in a combined fashion,"Donaldson said. "A denial does not necessarily equate to patients not getting the care they need." "Many researchers actually fear the converse that the incentives in the fee for service sector promote over treatment due to financial considerations [by providers]," Rother said. "Over treatment often results in extra expenses but can also result in harm to the patient."